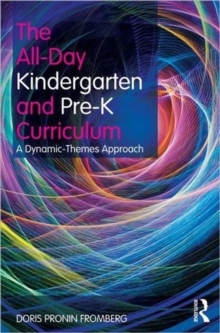 Grounded in theory and research, The All-Day Kindergarten and Pre-K Curriculum provides an activity-based and classroom-proven curriculum for educators to consider as they plan and interact with pre-k and kindergarten children. Allowing young children the opportunities to become independent, caring, critical thinkers who feel comfortable asking questions and exploring possible solutions, the Dynamic Themes Curriculum offers children the skills they need for responsible citizenship and academic progress. This book describes a culturally-sensitive pre-k and kindergarten curriculum in the context of literacy, technology, mathematics, social studies, science, the arts, and play, and also discusses:How to use the seven integrated conditions for learning to meet and exceed content learning standardsHow to organize for differentiated instruction and to integrate multiple forms of assessmentHow to teach literacy tools and skills in fresh waysHow to work with families, colleagues, and communityBuilding off of author Doris Fromberg's groundbreaking earlier work, The All-Day Kindergarten and Pre-K Curriculum presents a practical curriculum centering on how young children develop meanings. This is a fantastic resource for pre-and in-service early childhood teachers, administrators, and scholars.